The white coat colour of Yorkshire and Landrace pig breeds is caused by the dominant white I allele of KIT, associated with 450-kb duplications and a splice mutation (G > A) at the first base in intron 17. 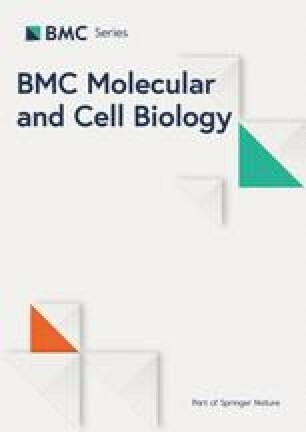 To test whether genome editing can be employed to correct this structural mutation, and to investigate the role of KIT in the control of porcine coat colour, we designed sgRNAs targeting either intron 16 or intron 17 of KIT, and transfected Cas9/sgRNA co-expression plasmids into the kidney cells of Yorkshire pigs. The copy number of KIT was reduced by about 13%, suggesting the possibility of obtaining cells with corrected structural mutations of the KIT locus. Using single cell cloning, from 24 successfully expanded single cell clones derived from cells transfected with sgRNA targeting at intron 17, we obtained 3 clones with a single copy of KIT without the splice mutation. Taken together, the 12.5% (3/24) efficiency of correction of structural mutations of 450 kb fragments is highly efficient, providing a solid basis for the generation of genome edited Yorkshire pigs with a normal KIT locus. This provides an insight into the underlying genetic mechanisms of porcine coat colour. Ke Qin and Xinyu Liang contributed equally to this work. The online version of this article ( https://doi.org/10.1186/s12860-019-0184-5) contains supplementary material, which is available to authorized users. Artificial selection in different regions of the world has strongly accelerated porcine evolution and has resulted in pig coat colour variations in contrast to their wild ancestors . Variability in several genes has been shown to affect pigmentation in pigs. Among them, KIT (Dominant White locus) may play a major role in determining the white coat colour in the Yorkshire and Landrace pig breeds. 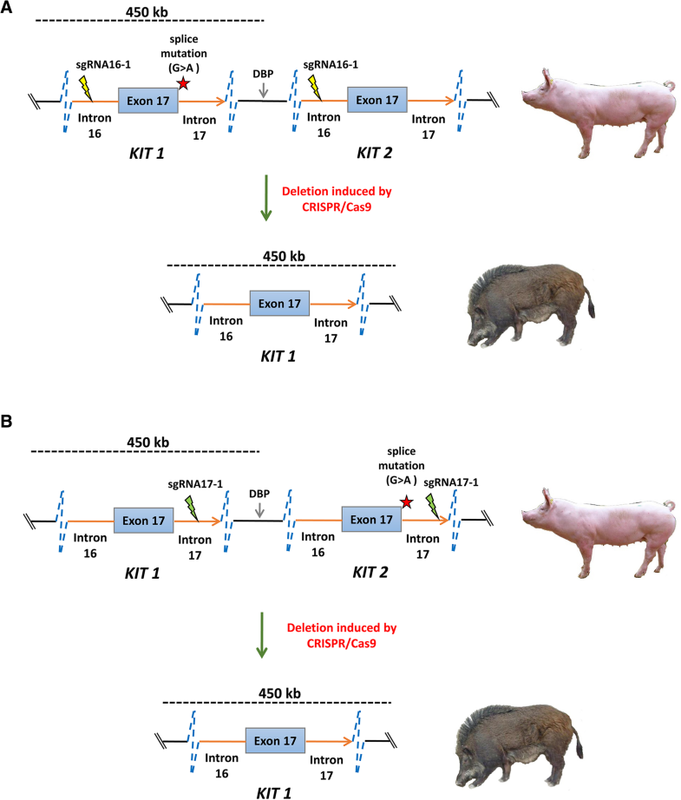 KIT was previously mapped to chromosome 8 of pigs, encoding the proto-oncogene receptor tyrosine kinase, which plays a crucial role in the survival and migration of neural-crest–derived melanocyte precursors . Four alleles have been identified at the dominant white locus: the recessive i allele for wild-type solid colour, the semi-dominant Ip allele for the patch phenotype, the fully dominant I allele for the dominant white phenotype, and IBe for the dominant belt phenotype . A splice mutation (G > A) at the first base of intron 17 in a 450 kb duplication is found in I allele of Yorkshire and Landrace pigs, which is assumed to act as a regulatory mutation and has a phenotypic effect due to the overexpression or dysregulated expression of KIT [10, 14]. However, this assumption has not yet been validated by functional studies, mainly due to the difficulty associated with correcting structural mutations of a 450-kb locus. The emergence of genome editing technology may provide us with an opportunity to overcome this problem. The clustered regularly interspaced short palindromic repeats (CRISPR) and CRISPR-associated (Cas) system has become a powerful and versatile tool for genome engineering. The CRISPR/Cas9 system is composed of two components: a single guide RNA (sgRNA) and a Cas9 endonuclease. The sgRNA is composed of a target-specific CRISPR RNA (crRNA) and an auxiliary trans-activating crRNA (tracrRNA). It can guide the Cas9 protein to a specific genomic locus via base pairing between the crRNA sequence and the target sequence [3, 9]. Subsequently, Cas9 produces site-specific DNA double-strand breaks (DSBs), which can stimulate DNA repair pathways via two competitive mechanisms, homologous recombination (HR) or non-homologous end-joining (NHEJ), where the NHEJ process is dominant and prone to generate targeted mutagenesis . In recent years, the CRISPR/Cas9 system has been widely employed in genome editing, including endogenous gene disruption, targeted sites insertion, and chromosomal rearrangements, in various organisms ranging from viruses to eukaryotes since its development [11, 19, 20], with advantages including easy programmability, wide applicability, and time saving. Here, we employed CRISPR/Cas9 to delete the duplicated copies of the 450-kb KIT locus and eliminate the splice mutation in kidney cells of Yorkshire pigs. The aim was to obtain donor cells with a normal KIT locus for somatic nuclear transfer in order to generate genome-edited Yorkshire pigs for further investigation ofthe molecular control mechanisms of KIT on the coat colour of pigs, and provided an insight into the generation of a new breed of Yorkshire pigs with wild-type coat colour. To evaluate the targeting efficiencies of the designed sgRNAs (Fig. 1a and Additional file 1: Table S1) at the KIT locus in the kidney cells of Yorkshire pigs, firstly, genomic DNA of cells with four copies of the KIT locus transfected with pX458-sgRNAs (Additional file 2:Figure. S1) were subjected to digestion by hetero-duplex DNA sensitive T7E1. 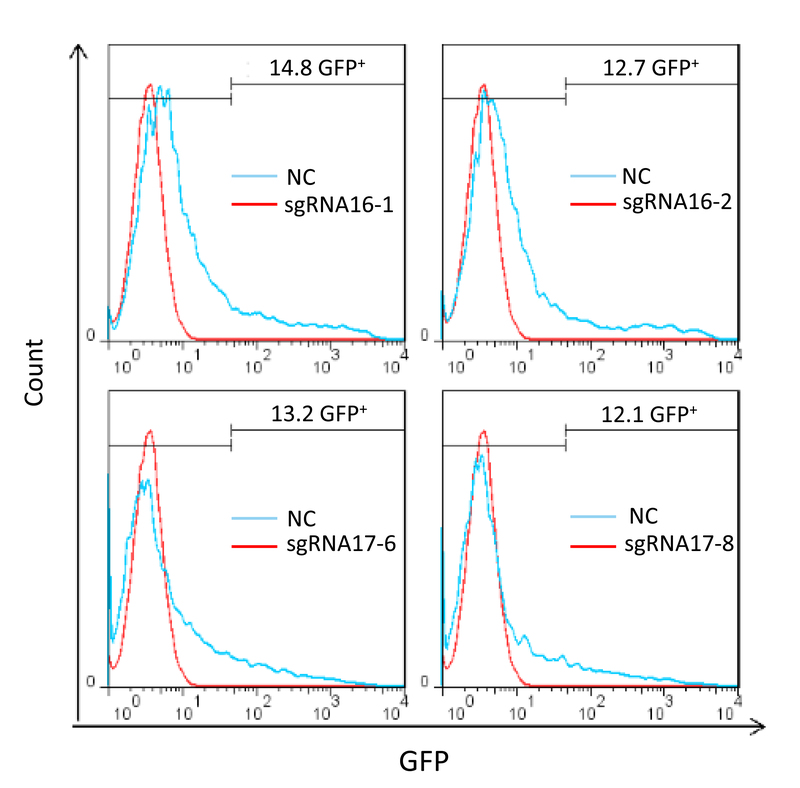 Significant cleavage bands at target T7E1 demonstrated that each sgRNA was able to efficiently induce NHEJ at its target site. The two sgRNAs targeting intron 16 presented a relative higher efficiency (40% for sgRNA16–1; 37% for sgRNA16–2) compared with the two sgRNAs targeting intron 17 (23% for sgRNA17–6; 21% for sgRNA17–8) (Fig. 1b). Transfection followed by sorting the EGFP positive cells by FACS (Additional file 3:Figure. S2) was found to effectively enrich cells transfected with sgRNA and thus improved the proportion of edited cells (Fig. 1b). The T7E1 assay tended to underestimate sgRNAs with higher mutation frequencies because mutant sequences can form homoduplexes, which are insensitive to T7E1 digestion . Therefore, we further cloned the PCR amplicons containing the sgRNA target sites into the pMD18-T simple vector for Sanger sequencing to quantify the NHEJ events. In unsorted cells, the mutation frequencies induced by sgRNAs (35.3% for sgRNA16–1; 27.5% for sgRNA16–2; 36.8% for sgRNA17–6; 15.0% for sgRNA17–8) were close to those estimated by the T7E1 assay, while in sorted cells, the mutation frequencies (88.9% for sgRNA16–1; 83.3% for sgRNA16–2; 50.0% for sgRNA17–6; 44.4% for sgRNA17–8) induced by the sgRNAs were significantly underestimated by T7E1 assay (Fig. 1c). Since the designed sgRNAs were able to guide the Cas9 to cut at the target sites efficiently, we further investigated whether they were capable of deleting the duplicated copies of the 450-kb KIT locus with the splice mutation, thus correcting the structural mutation. The relative order of KIT copies (with and without the splice mutation) has not yet been established. However, it is possible to determine the order in the allele with only one duplicated copy by CRISPR/Cas9. If the copy with splice mutation is upstream of the normal copy, efficient deletion induced by sgRNA targeting intron 16 will remove the mutated copy, and the normal copy will remain in the genome (Fig. 2a). In contrast, if the mutated copy is downstream of the normal copy, efficient deletion induced by sgRNA targeting intron 17 will correct the structural mutation (Fig. 2b). Successful deletion of the KIT copy with the splice mutation will affect the G/A ratio in the first nucleotide of intron 17. This could be detected by Nla III assay (Fig. 3a). sgRNAs targeting intron 16 increased Nla III digestion, especially in cells sorted by FACS, which indicated KIT copies with splice mutation is downstream of the normal KIT copy (Fig. 3b). On the other hand, sgRNAs targeting intron 17 had no apparent effect on Nla III digestion (Fig. 3b), suggesting that Nla III digestion has limitation in detecting copy number variations in a small fraction of cells. Therefore, we further cloned the PCR amplicons containing the splice mutation into the pMD18-T simple vector for Sanger sequencing to quantify the G/A ratio. sgRNAs targeting intron 16 were clearly found to increase the percentage of splice mutations, especially in cells sorted by FACS, while sgRNAs targeting intron 17 reduced the percentage of splice mutations in both sorted and unsorted cells (Fig. 3c). This result further implies that the KIT copy with the splice mutation sites is downstream of the normal copy. Finally, we used real-time PCR to quantify the KIT copy number variation in cells edited by CRISPR/Cas9. We found all sgRNAs were able to reduce the copy number efficiently in sorted cells, with a 13.30% reduction by sgRNA16–1, a 9.20% reduction by sgRNA16–2, a 12.40% reduction by sgRNA17–6, and a 4.90% reduction by sgRNA17–8 (Fig. 3d). These results indicate the possibility of obtaining cells with corrected structural mutations at the KIT locus. Since sgRNA16–1 and sgRNA17–6 were found to induce copy number reductions of the KIT locus relatively more efficiently, single cell clones were generated from cells transfected with either Cas9/sgRNA16–1 or Cas9/sgRNA17–6 (Additional file 4: Figure. S3). An Nla III assay was first applied to detect whether the KIT copy with the splice mutation was completely removed from the genome. As expected, none of the 23 single cell clones derived from cells edited by Cas9/sgRNA16–1 were resistant to Nla III digestion. In contrast, 12.5% (3/24) of the single cells derived from cells edited by Cas9/sgRNA17–6 presented complete resistance to Nla III digestion (Fig. 4a). This result demonstrates that the KIT copy with splice mutation is downstream of the normal copy, and that it can be completely removed through large fragment deletion induced by sgRNA targeting intron 17 (Fig. 2b). 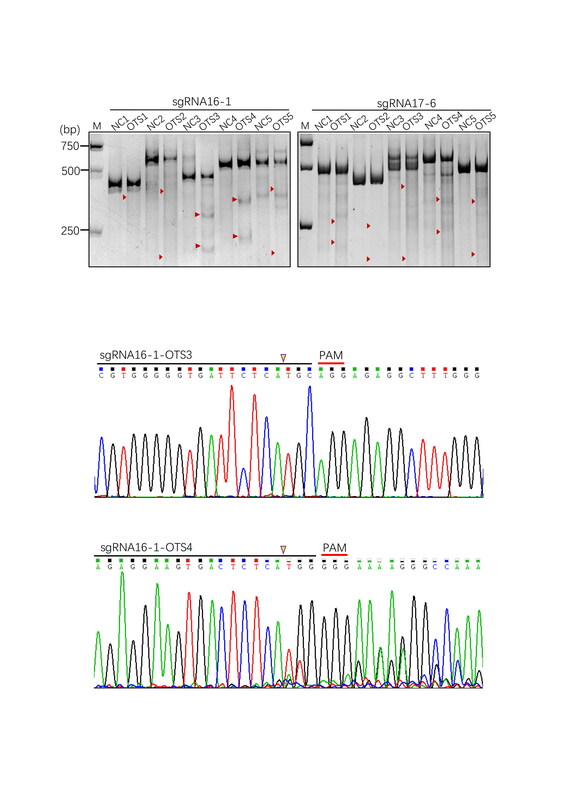 Sequencing analysis of the splice mutation site in each clone confirmed that the mutated nucleotide A was absent in clones resistant to Nla III digestion (e.g. sgRNA17–6 #3 clone); the percentage of mutated nucleotide A decreased in clones with reduced sensitivity to Nla III digestion (e.g. sgRNA17–6 #11 clone); and the percentage of mutated nucleotide A increased in clones with increased sensitivity to Nla III digestion (e.g. 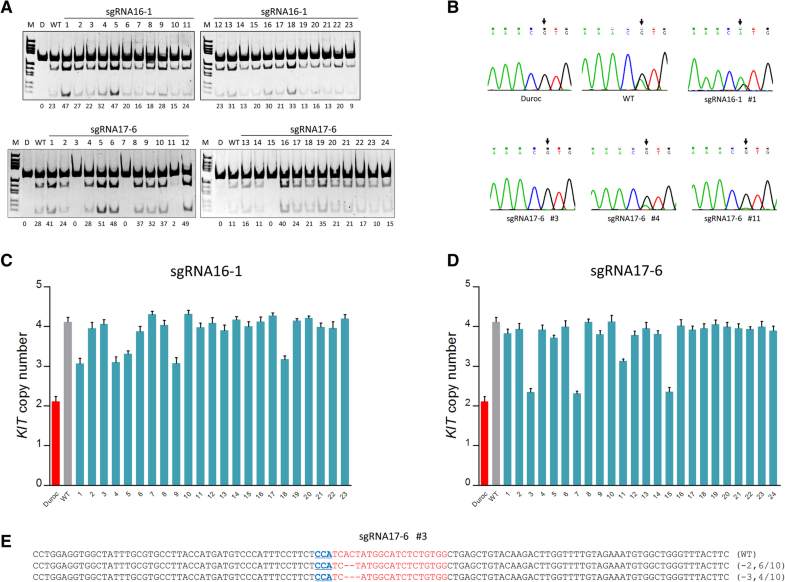 sgRNA16–1 #1 clone) (Fig. 4b). The copy number of the KIT locus in each single cell clone was quantified by qPCR (Fig. 4c and d). Consistent with the Nla III assay, out of the 24 single cell clones, the copy number in the 3 single cell clones presenting complete resistance to Nla III digestion, was corrected back to the normal two. In addition, in one single cell clone edited by Cas9/sgRNA17–6, the copy number was reduced from 4 to 3, consistent with its reduced sensitivity to Nla III digestion. Thus, taken together, Cas9/sgRNA17–6 was capable of inducing the deletion of the KIT copy with splice mutation at a frequency of 16.7% (4/24). Moreover, Cas9/sgRNA16–1 was capable of removing one duplicated KIT copy from the genome at a frequency of 21.7% (5/23). In the single cell clone (sgRNA17–6 #3) with corrected KIT structural mutations, in each allele, only small deletions (2 and 3 bases deletions) were found around the cutting site of sgRNA17–6 (Fig. 4e). Small modifications at intron 17 generally do not affect the expression of the KIT gene. The off-target effects (OTE) of CRISPR/Cas9 could potentially affect the health of genome-edited animals. We thus analysed the potential off-target sites (OTS) in the sorted cells by analysing each of the five top-scoring loci of sgRNA16–1 and sgRNA17–6. The T7E1 assay results indicated that sgRNA16–1 could induce unintended cleavage at OTS3 and OTS4, while sgRNA17–6 was unable to induce unintended cleavage at any of the five analysed OTS (Additional file 5: Figure S4A). Sequencing analysis demonstrated that sgRNA16–1 could only induce unintended cleavage at OTS4 but not OTS3 (Additional file 5: Figure S4B). In order to further confirm the specificity of sgRNA 17–6, we randomly selected 5 OTS with high, medium, or low scores for the T7E1 assay, and found that none of these OTS were able to induce unintended cleavage (Additional file 6: Figure S5 and Additional file 1: Table S5). Therefore, in order to minimize the potential off-target effect of edited genomes on the health of pigs, sgRNA17–6, but not sgRNA16–1, was used for the establishment of Yorkshire kidney cells with normal KIT copies for the future generation of edited pigs. The domestication and selection of pigs has resulted in a large variety of coat colours and patterns that are characteristic to different pig breeds and populations [12, 15]. Pig coat colour has been the focus of genetics studies for decades, and with the help of molecular genetics, scientists have identified the genes and mutations responsible for most of the coat colours and patterns found in pigs . Structural mutations of the KIT gene have been suggested to play major roles in determining the white coat colour in pigs . However, the functional study of these mutations has not yet been carried out, most likely due to difficulty associated with correcting a 450-kb fragment duplication using conventional genetic engineering technology. With the advent of the CRISPR/Cas9 system, a versatile genome-editing tool, scientists are now capable of generating a variety of mutations, including structural mutations, in mammalian genomes. In recent years, CRISPR/Cas9 has been successfully used to generate a 350-kb deletion in the mice LAF4 gene to obtain Nievergelt Syndrome , which is one example of rapid in vivo modelling of genomic rearrangements. The successful deletion of the duplicated 450-kb KIT copy in our study confirmed the advantages of CRISPR/Cas9 in the engineering of structural variants. Chromosome deletion usually relies on the cellular delivery of a pair of sgRNAs to create two DSBs at a locus in order to delete the intervening DNA segment by NHEJ repair . In this study, we used single sgRNA for the deletion of duplicated copies of a large DNA fragment. This is a relatively easier and more efficient method for cell transfection than the transfection of a pair of sgRNAs. We successfully deleted two duplicated copies of the 450-kb KIT locus in porcine primary cells at a frequency of 12.5%, which is comparable to previous reports on kilobase-size deletions in other cell types with efficiencies ranging from 1 to 13% [7, 8, 18, 23]. To the best of our knowledge, this is the first report regarding the engineering of structural variations in the genomes of livestock. In conclusion, we used CRISPR/Cas9 for the efficient correction of structural mutations in the 450-kb KIT locus, providing donor cells for the creation of genome-edited Yorkshire pigs with normal KIT copies. This provides a basis for the further investigation of the underlying genetic mechanisms of porcine coat colour and the possibility for the generation of a new breed of Yorkshire pigs with wild-type coat colour. Guide sequences for two sgRNAs (sgRNA16–1, sgRNA16–2) targeting intron 16 and two sgRNAs (sgRNA17–1, sgRNA17–2) targeting intron 17 of the porcine KIT gene were selected using an open tool: CRISPR DESIGN (https://benchling.com/crispr). The oligos of each sgRNA guide sequence were cloned downstream of the human U6 promoter via Bbs I restriction sites in the plasmid pSpCas9(BB)-2A-GFP (pX458) (Addgene plasmid #48138) to create the plasmid pX458-sgRNA. Positive clones were confirmed by Sanger sequencing (Sangon, China). sgRNA sequences and details were listed in Additional file 1: Table S1. Two New born Yorkshire piglets were purchased from Guangxi yangxiang Technology Co., Ltd. (China). After sacrificing these piglets, porcine kidney cells were isolated from kidneys and cultured in Dulbecco’s modified Eagle medium (Gibco, USA) supplemented with 100 units ml− 1 penicillin, 100 μg ml− 1 streptomycin (Gibco, USA), and 10% foetal bovine serum (Gibco, USA) at 37 °C under a 5% CO2 humidified atmosphere (Thermo, USA). The animal study was supervised the Institutional Animal Care and Use Committee of the Sun Yat-sen University (approval no. IACUC DD-17-0403) and used in accordance with regulation and guidelines of this committee. For electroporation, porcine kidney cells were harvested and counted, and 1 × 106 cells were resuspended in 100 μl buffer R (Invitrogen, USA), containing 10 μg pX458-sgRNA plasmid. The mixture was then transfected through electroporation at 1650 V for 10 ms in 3 pulses using the Neon transfection system (Invitrogen, USA) and seeded into 6-well plates (Nunc, USA) with 2 ml preheated culture medium. After 24 h of transfection, the culture medium was refreshed gently to exclude dead cells. Cells were then observed and photographed with a fluorescence microscope (Nikon, Japan). After 48 h of transfection, cells were dissociated with trypsin (Sigma, USA) at 37 °C for 4 min and resuspended in PBS (Gibco, USA), then analysed and collected by fluorescence-activated cell sorting (FACS) using Aria II cell sorter (BD Biosciences, USA). EGFP-positive cells were sorted into 1.5-ml centrifuge tubes and centrifuged either for further culturing or used for the isolation of genomic DNA. The single cell was seeded into 96-well plates using Aria II cell sorter. After three weeks of culture, the single cell was expanded for subsequent analysis. Genomic DNA samples were extracted from EGFP positive cell populations using the DNeasy Blood & Tissue Kit (Qiagen, Germany) according to the manufacturer’s instructions. The targeted sites were amplified by PrimerSTAR HS DNA polymerase (TaKaRa, Japan) with the primer pairs and purified with a gel extraction kit (Omega, USA). Then, 300 ng purified PCR products for T7 endonuclease I (T7E1) assay were denatured and annealed in NEBuffer 2 using a thermocycler (Bio-Rad, USA), then digested with T7E1 (NEB, UK) for 30 min at 37 °C and separated by 10% native polyacrylamide gel electrophoresis (native-PAGE). Mutation frequencies were calculated based on the band intensities using Image J software and then PCR products were cloned into a pMD-18 vector (Takara, Japan) and sequenced to confirm the mutation efficiency by dividing the number of mutant clones by the number of total clones. Primers used for PCR are listed in Additional file 1: Table S2. 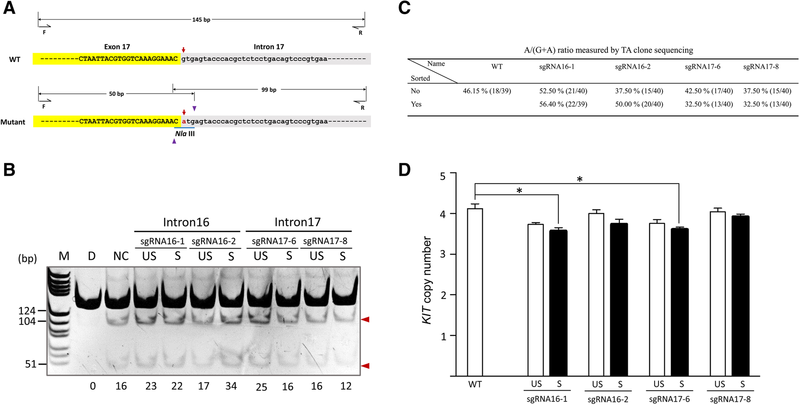 The G > A mutation in the first base of intron 17 of KIT introduces the restriction site Nla III. 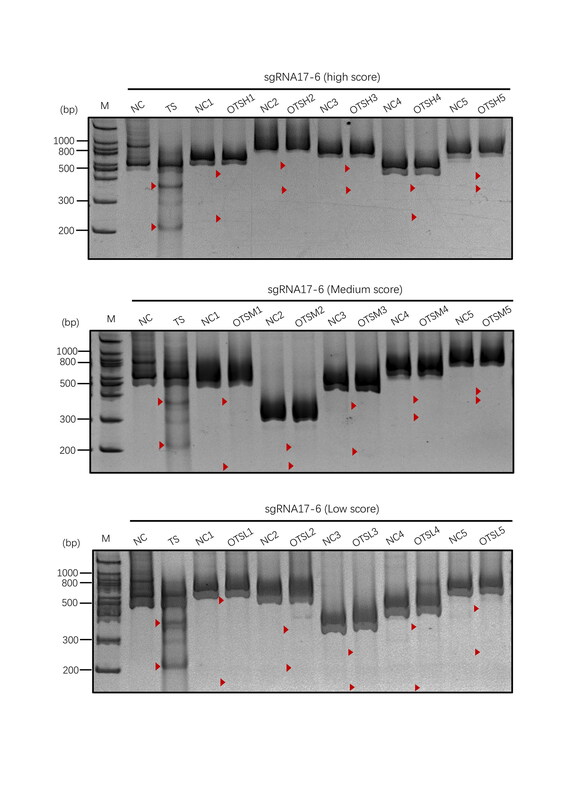 We amplified a 145 bp fragment across the splice mutation site and digested the PCR products using the Nla III enzyme to determine the efficiency of the deletion of KIT copies with G > A mutation by CRISPR/Cas9 (Fig. 3a). A complete deletion of KIT copies with the G > A mutation would eliminate the restriction site, which is detected as a failure to cleave the PCR product by Nla III. In contrast, a complete deletion of a normal KIT copy would result in complete digestion of the PCR product by Nla III. Purified PCR products for Nla III assay were amplified and digested with Nla III (Thermo, USA) for 5 min at 37 °C and separated by 15% native-PAGE. The primers used for PCR are listed in Additional file 1: Table S3. Copy number variation was estimated using real-time quantitative PCR and the 2-△△CT method as described by Livak and Soejima [13, 22]. The primers were designed using Primer-BLAST on NCBI and the primer details for KIT (Genbank accession number: CU929000.2) and COL10A1 (Genbank accession number: AF222861.1) are listed in (Additional file 1: Table S4). The copy number of c-kit was normalized against the Col10 region, a control region in the genome that did not vary in copy number between the pigs . The PCR reaction was performed using the Roch LC480 in 20 μl reaction volumes using ChamQ™ SYBR qPCR Master Mix (Vazyme, China). The procedure in the thermal cycling was an initial 5 min hold at 95 °C, followed by 40 cycles of 15 s at 95 °C, 30 s at 60 °C, and 30 s at 72 °C. To determine the site-specific cleavage of the CRISPR/Cas9 system in vitro, potential off-target sites (Additional file 1: Table S5) were evaluated by CRISPR DESIGN (https://benchling.com/crispr). Each five top-scoring off-target sites of sgRNA16–1 or sgRNA17–6 were selected for the T7E1 assay (Additional file 1: Table S6) and those yielding typical cleavage bands were considered as candidates. Finally, the PCR products of the candidates were sequenced to confirm the off-target effects. Further confirmation of the targeting specificity of sgRNA17–6 was carried out by analysing each five off-target sites with high, medium, or low scores (Additional file 1: Table S5) by T7E1 assay (Additional file 1: Table S6). This work was jointly supported by National Transgenic Major Program (2016ZX08006003–006) and the Natural Science Foundation of Guangdong Province (2016A030313310). KQ, XYL, GJS, XS, MW, ZYH performed and analysed experiments, ZYH, YSC, XHL, HBL designed the project and wrote the paper. All authors read and approved the final manuscript. Zhang L, Jia R, Palange NJ, Satheka AC, Togo J, An Y, Humphrey M, Ban L, Ji Y, Jin H, Feng X, Zheng Y. Large genomic fragment deletions and insertions in mouse using CRISPR/Cas9. PLoS One. 2015;10(3):e0120396. https://doi.org/10.1371/journal.pone.0120396. eCollection 2015.